Kayla says this was her first time on a dating site and that she was “naïve and stupid.” We don’t think she’s stupid. In fact, we believe she’s become very savvy at sniffing out fraudsters. But it comes at an emotional cost. In just a few weeks of communicating with David, he led her to believe that he was really in love with her. He said he had made arrangements to come to England on business and also to see Kayla. However, he had to stop over in France to take care of unfinished business there, he said. To quote Kayla… “it was all so lovely and believable…until he suddenly got stuck in France on a rig of some kind and he asked if I could send money to his children!” He couldn’t send the money himself because he was stuck with no way to send it to his kids, Kayla told us incredulously. Kayla knew that couldn’t be right, since we all have international banking facilities at our fingertips using a smartphone! Kayla was originally told that David’s children were being looked after by a Brazilian woman who doesn’t speak English. (Does that make sense?) She rightfully wondered why he would need money to be sent to his kids if he was a seasoned traveler and businessman? Surely, she surmised, they must have been well taken care of, right? David insisted to her that his poor kids were in a desperate situation because the Brazilian woman left and his best friend was looking after them, but the best friend didn’t have any money. When Kayla pressed him about this situation she said “he got shirty and I blocked him, and that was the end of it.” Here’s a British colloquialism Americans are not likely to understand, but worth learning from Kayla. “He got shirty!” To “get shirty” means he behaved in a bad-tempered and rude way because he was annoyed with something, in this case with Kayla’s questioning. Kayla informs us that David Roosevelt’s phone number is +14389926023. He says he owns a jewelry business dealing in gold and claims he took it over from his late father (who was from Boston.) He also says he lost his wife to cancer in 2014 and has a young son (Liam, age 5) and daughter (Michelle, age 7). The third man Kayla met in just a few weeks was named “Richard Sandy Parnes,” supposedly an International Broker and planning to retire soon. (Phone number: 0114018304974) Kayla told us he was very, very nice and believable as well! Unfortunately, he also asked Kayla for money while on business in Hong Kong! Kayla dropped him immediately, saying “there’s no way being an international broker, that he wouldn’t have enough money on him to travel on business!” He, too, got stuck and needed Kayla’s financial help to return home. Supposedly, Mr. Parnes has one daughter studying law in a university somewhere and is divorced from his wife, who he described as a “coke-head.” His English went from bad to worse, Kayla says. Finally, to add insult to injury, Kayla met three military men in quick succession. The first military man would only email Kayla and disappeared as soon as she asked some challenging questions. His name on POF was Tony Hopkinson (on a Military in Peace Mission in Syria, he said.) His English suddenly became very monotonous and he forgets what he’s written, Kayla said. Tony’s email was listed as tonyhop000 “@” gmail.com. (Three zeros after “tonyhop”) As of our publication date, Kayla is till in touch with the second military man via email. Christian Berge is his name (Email: christianberge2121 “@” gmail.com) and he is supposedly an Englishman from Talke, England who is working in the US. He says he has no children and his wife died some years go. He was just completing his contract work as a contractor off-shore. However, he said he couldn’t cash his paycheck until he comes back to the UK and wanted Kayla to send him $1,000 using a Money Gram card sent to his “agent,” a woman named Christina Annette Harris. This was so he could buy a flight home to the UK! Kayla told us that she’s never heard anything more ridiculous in her life! She was most saddened by this because she was developing a genuine fondness for Christian. Now Kayla thinks that “Christian” may have actually been a woman because “his” language was so much gentler and more considerate. How sweet! Considerate, female scammers! Verify, verify, verify someone’s story! If you begin to take an interest in someone, ask to video chat, ask for photos to verify what they tell you about themselves. Ask for the names of their businesses or addresses or phone numbers and then look them up. Yes, they can steal this information off the Internet in an effort to fool you but now you have multiple points of references to help you tell truth from lies. And we can recommend a service to help you verify names, phone numbers, addresses and more! Even criminal records! If the people you are checking out say they live in the United States, use Spokeo.com to investigate them! Protect yourself and put scammers on notice! Into your dating profile, state very clearly that you will never, ever, under any circumstance send money to anyone you meet online unless and until you marry them! We hope this would deter many scammers from bothering with you because you want them to believe they won’t be able to make money from you. If you REALLY want to empower yourself, create/join a club of people who use dating apps and vow NEVER, EVER to send money to men and women they meet online! Keep a healthy dose of skepticism! Sadly, it is simply too easy to deceive others online and dating services are notorious for attracting fraudsters. So be doubtful about much of what you see and read, especially if someone professes their love for you AND you haven’t spent any time together in person or for very long! the username or details. He urged me to remove my POF profile too. He shared his web address, featuring his name but with a different spelling, and other strange content. I didn’t query or share these anomalies with him. We exchanged a couple of photos which showed the same chap on POF, and along the way, he told me he was restoring an antique statue to present to the National Museum in Liverpool in 3 days in hopes of winning a contract to purchase artwork for them. At this stage I had a few doubts anyway, but as we texted to and fro he planned his flights to Abu Dhabi to begin the task, and talking on the phone about champagne which he couldn’t spell, his labrador dog that he appeared to have no real enthusiasm for, and his crap phone that didn’t support video calls, something didn’t ring true! A WHOIS check of his website gunterartscollection.com shows it was purchased the day before he approached me on POF. [TDS NOTE: We confirmed that Gunter’s domain was purchased on May 27, 2018 and his website was built immediately thereafter. Also, “Gunter’s” domain was registered in Zambia, south-central South Africa and is being hosted on a server in Johannesburg, South Africa. For his address on his website he simply listed an artists business address in Florida.] A google reverse picture search showed his “antiques” on various other sites, and also uncovered a duplicate site purchased three months before, with the same anomalies and a different-named artist! We are confident that “Gunter” is a con-artist. Does his game sound similar to others you’ve experienced? Let us know! Lucy wondered why Heinrich Gunter never wanted to arrange a meeting with her during their weeks of communicating, when he clearly showed an interest in her. 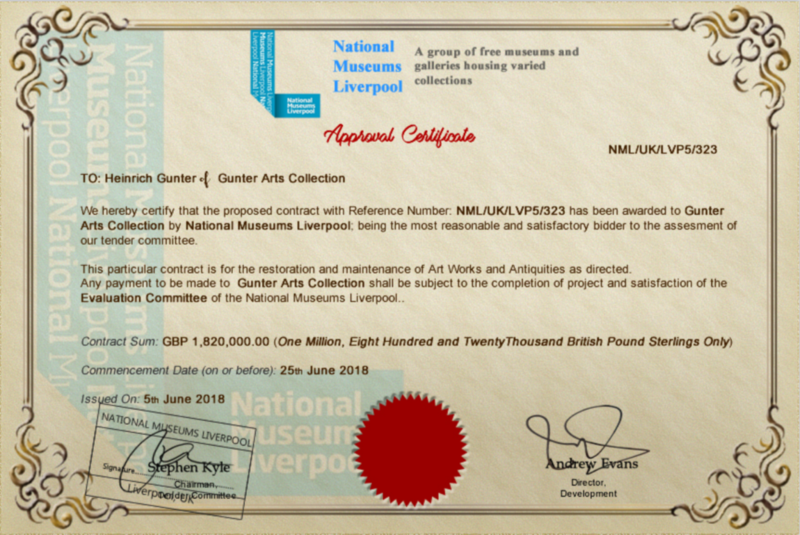 Heinrich Gunter, or whatever his real name is, sent Lucy the following “Appraisal Certificate” from the National Museums Liverpool, to suggest that he is legitimate and worth a lot of money. It’s meant to impress women. But as Lucy told us, “It looked fake to me. 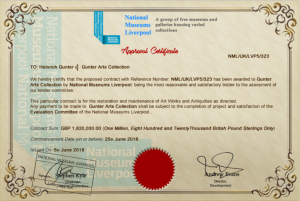 I didn’t ever refer to it in emails to him.” She tried to find the signatories on the Liverpool Museum’s website but could not find the names listed on the certificate. Recently, Heinrich Gunter actually called Lucy’s cell phone. She told us that he sounded nothing like she imagined him to sound. In her words, she described his voice as “very young and African was my immediately thought, certainly not German!” Lucy said he called her from a different phone number than what she had been texting from. She gave that number to her sister-in-law, who is Swiss/German, so she could send him a message. This made Heinrich Gunter very angry! When we asked Lucy for Heinrich Gunter’s profile on Match.com, it turns out that he removed it shortly after she gave him her email address and began a text conversation. TDS is finding this to be common practice amongst dating scams of all kinds. Once the connection has been initiated to the victim, the profile is removed. That way, if a victim becomes suspicious and wants to report it or capture it to give to folks like us or the police, they can’t! Also, Heinrich asked Lucy to leave Match.com once they had begun an online relationship and she agreed to do so. Lucy also told us that in the beginning he was perfectly plausible but soon she became suspicious. She says his website didn’t look real and then she found it was a direct copy of another website by someone called Dirk Dressel. Lucy wonders if Dirk Dressel’s website is fake as well. She also said that Heinrich Gunter mentioned God in every email. We’ve previously reported that this is common from many African scammers. Also, Heinrich Gunter said that he couldn’t video chat with Lucy because he has “network issues.” This is a HUGE RED FLAG and cause for immediately terminating any online relationship! One of our TDS readers contacted us recently to report an online relationship scam. She wishes to keep her privacy so we’ll call her “Vera.” Vera is a middle-aged woman looking for a partner. Like many single people today, she uses dating apps including Plenty of Fish (POF). Overwhelmingly, our readers report more scams targeting them through POF than any other dating site/app and, as in any game of roulette, Vera’s luck ran out. 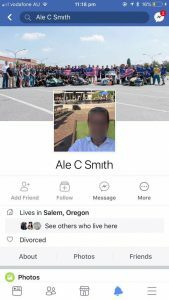 Vera was contacted by a man named Ale Smith Coplane, who claims to be Greek American living in Salem, Oregon. 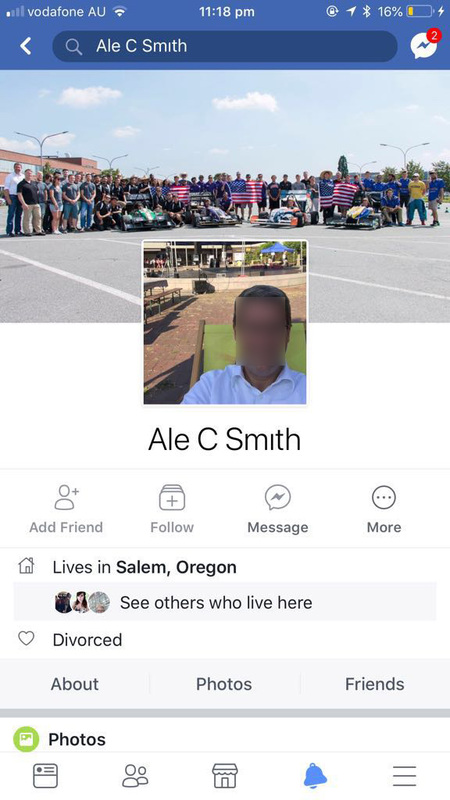 Ale is about age 55, says he is living in a rented accomodation in Salem, Oregon and claims to work as a contractor with Anderson Construction, based in Scotland. (We reached out to Anderson Construction to ask about his employment. Not surprisingly, they never replied to our query.) He says that he has been divorced for four years, and has a daughter named Linda Alesmith, who is 20 years old and lives in Turkey. His ex-wife, an American, has the house. And, to demonstrate to Vera that Mr. Smith Coplane is telling the truth, he provided several photos, including his Facebook profile photo. (We blurred the man’s face.) Of course, photos and screenshots are available by the millions across the Internet. His daughter, Linda, has a last name that is a combination of her father’s first and middle names. Vera told us that Ale Smith Coplane contacted her on POF. She replied to him that they did not match in many ways, a polite way of saying that she wasn’t interested. But he persisted. Vera said she learned quickly that he is very jealous and intense. He wanted to know what other people she was communicating with online. He even had his daughter, Linda Alesmith, speak to Vera online (via text) and thrn through a video chat (which is very unusual). Vera said that Linda had both American and Turkish phone numbers. And she also has a typical Greek accent. Again, as if to prove who she is, Linda sent Vera a photo of her passport at one point. This also strikes us as extremely odd. It’s as if Linda is trying much too hard to “prove” her identity to Vera. Linda also asked Vera for a birthday gift of £500 and said that as a potential step-mother, Vera should give it to please Linda and gain the trust of Linda’s father. As Vera told us… “Never have I heard such crap in my life!” Linda got very rude when Vera refused to give her anything. Vera communicated with this man a number of times online and over the phone over several weeks. She described him as sounding old and grumpy. He doesn’t sound American at all, she says, even though he said he’s lived in Salem, Oregon for many years. When she asked him to video chat, he said he couldn’t video chat because he was on the company ”divice’.” (His misspelling.) Security reasons prevented him from a video chat but he works for a construction company? When someone you are socializing with online refuses to video chat, that is a MAJOR RED FLAG that things are not what they appear to be! Ultimately, Vera asked Ale Smith Coplane a lot of questions about himself and this clearly annoyed him, she said. Finally, in their short relationship, Ale Smith Coplane asked Vera to help him. 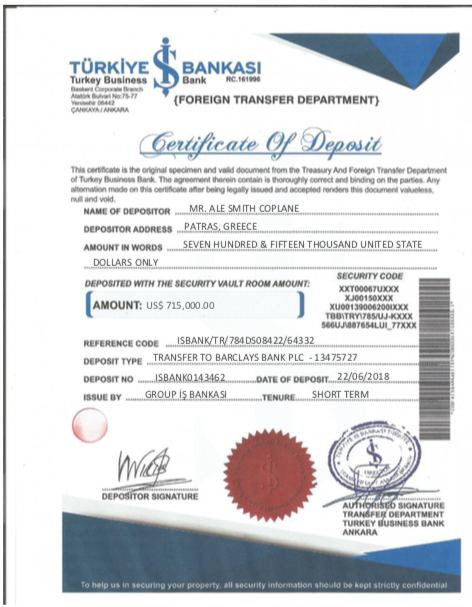 Ale Smith Coplane maintained that he has $715,000 sitting in a bank in Turkey. It was money he inherited from his late father, he said. We’re not sure how or why that money is in Turkey but whatever… He didn’t want his ex-wife to have 50% of this money so he wants to transfer it to the UK since he is working in Scotland. And so he asked Vera, as a potential partner, to help him do that. He also described some method of transfer that would help him avoid taxes and various charges that Vera did not clearly understand. But apparently, Vera asked too many questions of this man and made him angry. On the other hand, Ale Smith Coplane asked Vera how much money she earned after she said she wouldn’t send $4000.00 to open the account at the bank in Turkey. Vera refused to tell him. He then said ”Is that a jok???? (another misspelling) You don’t have $4000.00 ???? How do you survive in England?? Also, a £500 present is nothing!!!! !” Vera said she never got real or valid answers from this man and dropped him. When Vera contacted us, we told her this sounded like an elaborate scam intended to trick her into depositing her money into an overseas account. There is no legitimate reason in the world why a bank needed her or anyone to transfer that sum of money to OPEN an account or establish a connection between accounts. Greeting from Türkiye İş Bankasi, we got your email, please be informed that due to Türkiye İş Bankasi procedure on deposited fund, you have only three (3) more banking days to set up your NRDDA and your deposited fund transferred from your new bank account with Türkiye İş Bankasi to your Barclay bank account there in your Country as directed by the depositor Mr. Ale Smith Coplane, and it is not good for your deposited fund to remain here after this week to avoid incurring Deposit Charges. *There is No other way, this bank has the only practical option of transfer through an NRDDA with a minimum deposit of US$4,000 which by any case will remain in your account and serves as a Minimum deposit to open a NRDDA with Türkiye İş Bankasi. The said amount US$4,000 will immediately be added to your total deposited fund and will still be available to you as your money, it will be transfer with your total fund to your Barclay bank account there in England. It is our wish to serve you better! This email is total crap and the positive proof this is a scam! The email address used by the bank employee is “account “@” isbankt[. ]com.” It looks official, right? However, the real domain of Türkiye İş Bankasi (Bank of Turkey) is Isbank.com, not isbankt[.]com. This second domain is a look alike domain name with no available website according to Google and ServiceHostNet.com. Vera dodged a $4000 bullet! We heard from a woman named Holly, and she gave us permission to post this message about what happened to her. We believe Holly’s experience was a scam because no self-respecting man would ask for money a month into a relationship that is based entirely on texting. Also, no real man interested in building a friendship/relationship would only use texting. He would want to see the woman he is interested in, or at least hear her voice. A simple way to test this premise is to insist that you Skype, Facetime or use some form of video chat so you can meet him properly. If he comes up with different excuses why he cannot you have confirmed it is a scam! Even if he does video chat, be VERY careful! It may still be a scam. Also, we’ve seen many scammers who pretend to be in our military. We invite your comments and your stories about online dating. Email us at love-online@TheDailyScam.com.